Lion King returns to Providence Performing Arts Center next week. Lion King show will be in town till Sunday, 20 February, 2011. And if Providence is anything like the rest of the country, the show will do very well. For, almost 14 years after “The Lion King” opened on Broadway, it’s still breaking box office records, said Tom Schumacher, head of Disney Theatrical Productions. And there is no more exciting 15 minutes in theater than when the “animals” in the show come parading down the aisles of the theater. Those who have seen the show know that the big idea behind it is the notion of the “circle of life.” The musical opens with the birth of Simba, the lion cub who is destined to rule Pride Rock. We watch him develop through tough times, and grow to an adult, when he and Nala have their own son. Another big plus for the show is the catchy score that mixes pop ballads from Elton John with the pulsing choral numbers of South African composer Lebo M.
Even though it is based on a popular kids’ movie, the musical is not for small fry, said Schumacher. The show’s too long, and too sophisticated for a 5-year-old, he said, but 8 or 9 is fine. And for them “Lion King” provides some memories. “The Lion King” opens Tuesday, February 01 and runs through Sunday, February 20 at the Providence Performing Arts Center, 220 Weybosset St., Providence. Get $10 OFF on Lion King Providence RI Ticket Orders Over $350! Use Code AFF$10. 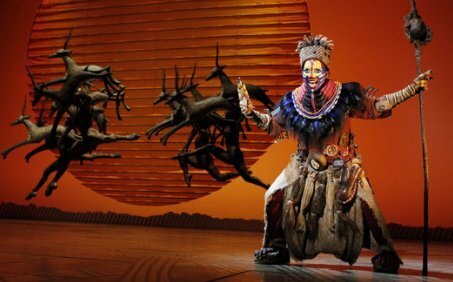 On Broadway, Lion King grossed $993,169 and had a 68.8% attendance rate for the week ending January 23, 2011. The 19 shows on the boards grossed $12,343,580, dropping 10.69% from the previous week. Below are the Top 10 Grosses for the week ending January 23, 2011. Disney’s The Lion King has increased its booking period by 3 months – tickets are now on sale to 2 Oct 2011 at the Lyceum Theatre. The success enjoyed by The Lion King at the Lyceum Theatre in the West End has led to the booking period being extended by three months. According to London Theatre, more than nine million people have now seen the production, which is based on the Disney film of the same name. It tells the story of young lion cub Simba, When the young lion prince Simba is born his evil uncle Scar is pushed back to second in line to the throne. Scar plots to kill both Simba and his father, King Mufasa, and proclaim himself king. Simba survives but is led to believe that his father died because of him and he decides to flee the kingdom. The Lion King, which recently celebrated its 11th anniversary, boasts tunes by widely-acclaimed songwriters including Elton John, Tim Rice and Hans Zimmer. Earlier this month, it was announced that the theatre production earned more than £34 million in 2010, which means it has set a new West End record for the second year in a row. Tavarez, who starred in the Broadway production of “The Lion King” as Young Nala, was in need of a bone-marrow transplant, but a perfect match was not found despite a drive being held in July. A bone marrow donor registry drive is being organized in memory of Shannon Tavarez, the 11-year-old Broadway actress who died of leukemia at Cohen’s Children Medical Center in New Hyde Park in November, according to the Associated Press. The drive will be held by DKMS, a bone marrow transplant center, on Sunday at the Harlem School of the Arts from 1-7 p.m. Registry requires a swab of the inner cheek. She received an umbilical-cord transplant in August in lieu of the bone-marrow transplant. Tavarez’s biracial ancestry — her mother is African-American and her father Dominican — complicated the search for a perfect match because there are typically fewer registered donors from minority groups. Estimates from city-run venue Chrysler Hall show that “The Lion King” brought $4.6 million into downtown Norfolk, with additional boosts for hotels and shopping. “The Lion King” played to 76 percent capacity during its five-week stay from November through January, according to the city. During that 38-performance run, 66,078 paying customers saw the show. Two performances were cancelled because of inclement weather. “The Lion King’s” first run in Norfolk five years ago set a record, grossing $6.5 million with 98 percent capacity in sales by the end of its run in January 2006. That, however, was for a 45-performance run. A repeat was unlikely because 98 percent capacity is a rarity in the present economy. “The Lion King,” too, is in competition with itself, with 17 versions around the world, including productions in New York and Las Vegas. The company is now playing in Durham Performing Arts Center, Durham, N.C., along with its 39 hyenas, 52 wildebeests, several giraffes, gazelles, zebras, an elephant and one money-making lion. Future bookings will include, next season, another return of a previous box office success, “Wicked,” which had a successful run here two years ago. Zaire Adams is headed to the spring to star in the Disney Musical Lion King. His parents tell FOX6 they discovered his voice at age three, while he was singing with the car radio. The 4th grade students in Alysia Stewart-Browns class at Milwaukee’s Engleburg School learned together all school year long. 10-year-old Zaire Adams joined his classmates only six weeks ago. He just wrapped up singing and acting as an orphan in Twist that closed in Atlanta in October. It’s his big smile, and big voice that landed Zaire a 10-month long gig at Las Vegas’ Mandalay Bay Hotel. Zaire will leave Milwaukee again in March to play the lead role of young Simba in Disney’s Lion King. Zaire’s well on his way to being a star. He played Munchkin #1 in Milwaukee’s First Stage Theater production of the Wiz. Lion King is currently performing at Durham Performing Arts Center, Durham NC. Lion King Musical is constantly surprising in its storytelling methods, based on African traditions of drumming, chants and rituals. The show takes the audience into a mind-expanding world where dancers with swaying straw skirts and headdresses of foliage become grasslands, and cloud shapes manipulated on long sticks suddenly merge into a giant lion mask. Elton John’s songs, and especially the additional music by Hans Zimmer and Lebo M, enhance the show with haunting choral and percussion work. Garth Fagan’s choreography adds engaging energy, from leaping gazelles to stalking lionesses. The large cast requires alternates and understudies for most roles. At Thursday night’s official opening, Ntomb’Khona Dlamini made a lovable, irascible shaman, Rafiki, Kolton Stewart a cheeky Young Simba, Madai Monica Williams a sassy Young Nala, and Ta’Rea Campbell a feisty adult Nala. The second act slows down a bit with several unnecessary songs and plot diversions, but it’s a small price to pay for such a life-affirming, lessons-giving piece, a true family musical. “The Lion King” is a prime example of what musical theater can and should be. Lion King is currently playing on tour in Durham Performing Arts Center, Durham-NC. Get $10 OFF on Lion King Durham NC Ticket Orders Over $350! Use Code AFF$10. Lion King coming to Providence Performing Arts Center, Providence, RI from Tuesday, February 1 to Sunday, February 20. Casting has been announced for the Providence engagement of Disney’s The Lion King. The performance times for Lion King are Tuesdays at 7 PM; Wednesdays and Thursdays at 7:30 PM; Fridays at 8 PM; Saturdays at 2 PM and 8 PM; and Sundays at 1 PM and 6:30 PM. Buy Lion King Providence RI Tickets Online. Get $10 OFF on Lion King Providence Performing Arts Center Ticket Orders Over $350! Use Code AFF$10. The Lion King musical has set a record for the highest takings in West End history for the second year in a row. The Disney production earned more than £34m in 2010, a greater sum than any other show had over a 12-month period in London, GL. Disney’s award-winning production of Lion King smashed all previous West End box office records – including its own, set in 2009 – as it completed 2010 with two weeks of sold out performances. In addition to being the top-selling West End production of the year, seen by over 820,000 people in 2010, the show also grossed over £34 million (an increase of £2 million on the previous year) – the highest annual box office of any show in West End history. Over 9 million people have now seen it at the Lyceum Theatre. The Lion King, which became Broadway’s seventh-longest running show this month, grossed $1,993,370 at the Minskoff Theatre, surpassing the musical’s previous gross of $1,870,145, which was set during the week ending November 28, 2010. Two other Broadway musicals (Wicked and The Phantom of the Opera) have reported that they have broken their respective theater’s records for highest weekly grosses during the week ending January 2. The Broadway League has reported that grosses for the week for all shows totaled $34,997,571. In addition, 14 other shows grossed over $1 million for the week.